Enjoy your yard & relax. We’ve got the rest. Do you want your grass to be greener and healthier? Do you crave a thick lawn you can run barefoot in as your neighbors look on with envy? Don’t fool around with weed killer or burn your lawn with the wrong fertilizer, let the experts at Kentucky Professional Turf in Versailles, KY assess your lawn care needs and create a personalized plan of action. With over 30 years of lawn service experience, our specialists at Kentucky Professional Turf have perfected our highly rated Lawn Fertilization And Weed Control Program for a lawn that is lush and healthy, free of weeds, and liberated from crabgrass year after year. Seven times a year, our lawn care services experts will apply the proper blend of fertilizer and, when needed, broadleaf weed control and Pre-emergent Treatments. Almost all of our customers agree, our seven-step application program is the best solution for a healthy and emerald green lawn. However, we are flexible to the wants and needs of our customers and can adapt our Lawn Fertilization And Weed Control Program accordingly. Our seven-stage application schedule is tailored to your lawn’s individual requirements every step of the way. We utilize the latest in grass fertilization technology. Superior products are essential for a well-maintained lawn. At Kentucky Professional Turf, every treatment in our seven step lawn care program is customized to the time of the year, so that every application will provide the optimal results. You can be assured that our premium fertilizer blends, broadleaf weed control, and pre-emergent treatments will be suited to your lawn’s unique seasonal needs. This key component of our lawn care program will rid your yard of ugly broadleaf weeds like dandelions, clover, and more that grab resources away from the turf and disrupt your lawn’s texture. We’ve got the best weed killer around and know how to use it the right way. The experts at Kentucky Professional Turf have the know-how to assess your lawn’s unique needs and create a proper plan accordingly. We’ll carefully inspect your entire yard for invasion weeds that can be virtually eliminated by our professionals. Do you have crabgrass? You need to have it removed because it robs your lawn of precious nutrients. And it’s unsightly to look as well. At Kentucky Professional Turf, we’ve created a proprietary pre-emergent treatment for crabgrass control. Rid your yard of “bad” grass, allowing the “good” grass to flourish. We’ll keep crabgrass from spreading and kill existing crabgrass, so your lawn is full of green and never brown. Speak to one of our lawn care experts today for a free estimate and schedule your Kentucky Professional Turf Lawn Fertilization And Weed Control Program. 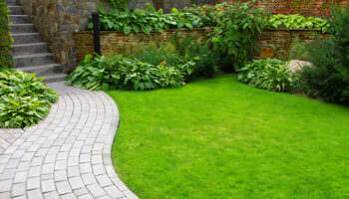 Enjoy a lush and weed free lawn with the help of our professional staff.